Fathered by a God, worker of miraculous cures, raised the dead – Asclepius. "Jesus will have to take his place with the host of other demigods whose fancied lives and deeds make up the mythology of the world." 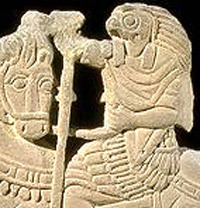 Horus becomes a Christ on horseback. Jesus can be anything you want him to be. 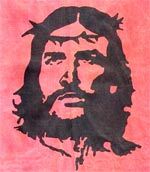 Surely not Jesus...? Yes, the image of history's greatest superhero has morphed from Greek god to Roman politician, from youthful shepherd to Renaissance prince. An imaginary paragon can always be in step with fashion. Tropaeum – ceremonial stake on which the Romans displayed captured armour. Did Julius Caesar Exist? Do you Exist? Nailing that nonsense about ancient evidence. "Suffering martyrs"? The fable of Christians thrown to the lions is as familiar as Goldilocks and the 3 Bears. Dare to know the truth? Before 110 AD - Gospels unknown & uncited. A 'sayings' document probably exists. c.130 AD Papias writes a paragraph in a six-book work mentioning that the 'teachings' of Peter, recorded by Mark, and 'reports' by Matthew in Aramaic had been written, although apparently he doesn't trust them. c.140 AD - Marcion's proto-gospel appears. He attaches Paul's letters to an early version of 'Luke'. c.150 AD - Justin refers to several 'memoirs of the apostles' (i.e. gospels). c.172 AD - From dozens of contending stories, 'official' gospels numbered as 4. c.180 AD - Gospels finally given names. The first universal religion of the Greco-Roman world anticipated Christianity in almost all major respects.